Nani's Krishnarjuna Yudham has got a good response in its pre-release business and earned Rs 47 crore from its theatrical, satellite and other rights. 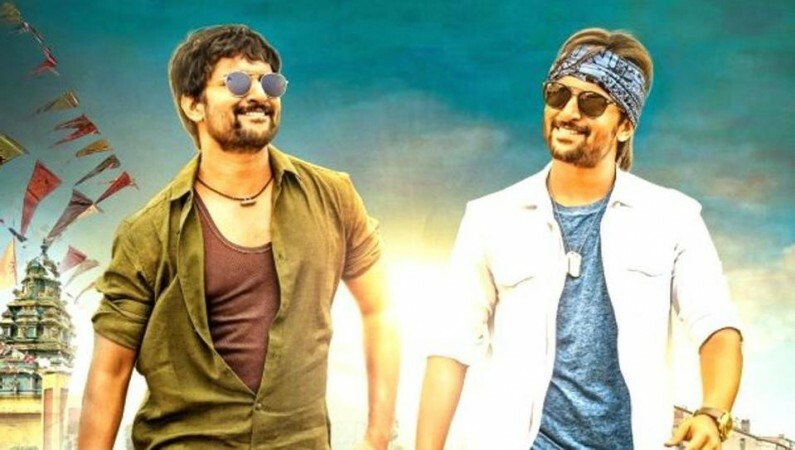 Nani's next outing Krishnarjuna Yudham, which will hit the screens, April 12, has made superb earning in its pre-release business with its theatrical, satellite and other rights fetching record prices. Nani who has churned out back-to-back hits and gone up the ladder with each of his new releases scored a hat-trick in 2017. The natural star is now gearing up for his first release in 2018 and his success graph has generated a lot of hype for his next movie Krishnarjuna Yudham. The hype surrounding Krishnarjuna Yudham had created a lot of curiosity among several leading distributors and TV channels who were vying for the film's theatrical and satellite rights. As the movie is all set to hit the screens this week, we hear that the makers have already completed the process of its pre-release business. As per reports, Krishnarjuna Yudham has earned Rs 35 crore from its global theatrical rights, Rs 7 crore from its satellite rights, Rs 4.50 crore from its Hindi dubbing rights and Rs 50 lakh from its music and other rights. The Merlapaka Gandhi directed film has fetched a total of Rs 47 crore in its pre-release business and these are the biggest numbers for a film starring Nani. Krishnarjuna Yudham (KAY) has beaten the records of Nani's Nenu Local (NL), Ninnu Kori (NK) and MCA (Middle Class Abbayi). Here are the price details of the area-wise rights of these four movies. These numbers are based on various reports and they may not match with actual figures. All the numbers are in Rs and crore. Krishnarjuna Yudham is an action comedy film written and directed by Merlapaka Gandhi and produced by Sahu Garapati and Harish Peddi under the banner Shine Screens. Nani is playing dual roles in the film, while Anupama Parameswaran and Rukshar Mir play the female leads. Ravi Awana and Brahmaji are seen in crucial roles in the movie, which has Hiphop Tamizha's music and Karthik Ghattamaneni's cinematography.